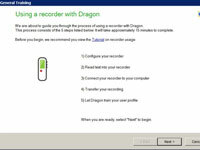 Your recorded voice sounds so different from your live voice that you have to train Dragon NaturallySpeaking to recognize it. Training NaturallySpeaking to understand your recorded voice is just like training it for direct dictation, with one difference: You read the training material into your recorder, transfer the dictation to your PC, and then have NaturallySpeaking transcribe it. 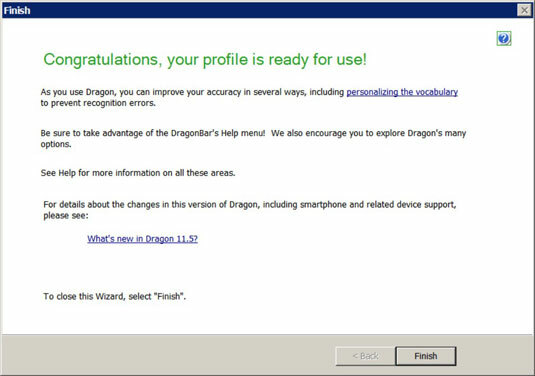 You use the User Profile Wizard to do this. 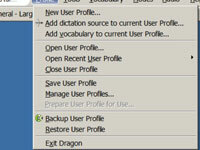 1Choose Profile→Add Dictation Source to Current User Profile. 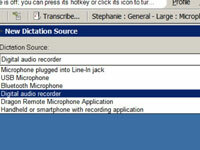 The New Dictation Source dialog opens. 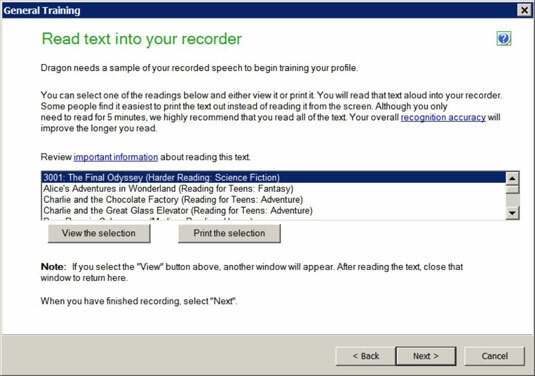 3Choose “Digital audio recorder” from the list and click OK.
A screen pops up that says, Recorder Training has not yet been successfully completed for this User Profile and dictation source. Here’s your opportunity to do so. 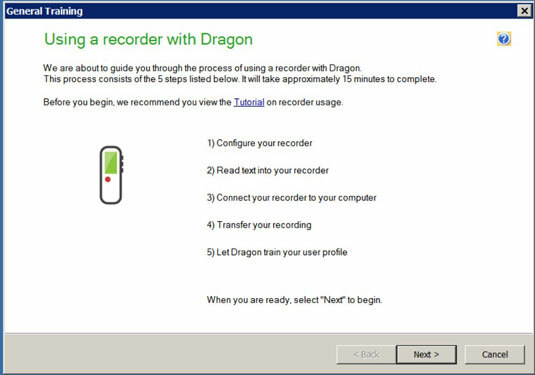 A screen appears to guide you through the five steps to get your recorder ready. 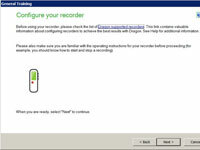 You will now configure your recorder. 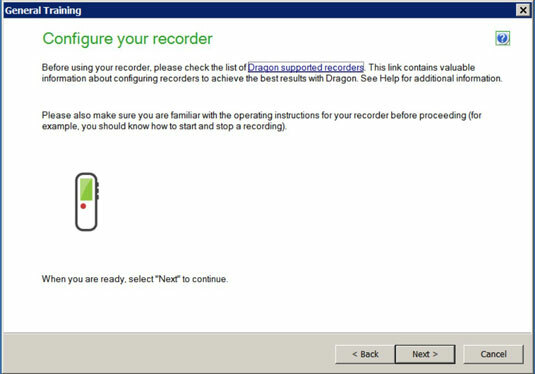 If you haven’t done so already, click on the link (as shown in the figure) to check for Dragon supported recorders. The wizard displays a selection of fine, edifying reading material to choose from in order to train your recorder. You are presented with several options to read. 7Make your selection and click the View the Selection button (or click the Print the Selection button if you prefer). A window appears with your chosen text. 8Read the copy provided. When you are done, click the Back button to return to the previous screen, and then click Next. 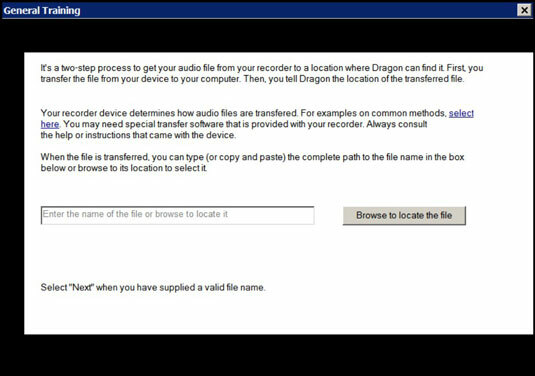 A screen tells you that you need to locate the file you just recorded. 9Click the Browse to Locate the File button to locate the file on your PC that you just recorded. Find the file and choose it so that it appears in the window. 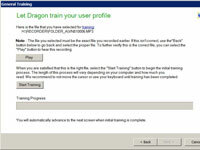 You see a screen that shows the name of the file you have selected for training. If it is correct, you can proceed to training. The training process will take several minutes, so don’t be impatient. 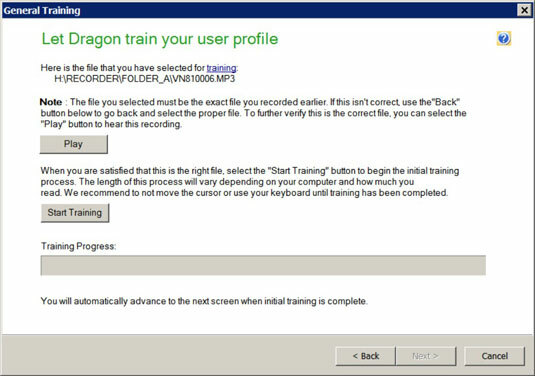 It is recommended that you don’t touch the computer keyboard or cursor until the training is complete. 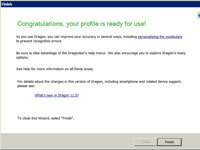 When the training is complete, you see a congratulatory screen. The next time you open your list of User Profiles, you will see that a new profile has been added with your name and your audio source: Digital recorder. 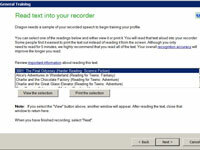 When you dictate using a recorder, NaturallySpeaking remains in Normal mode. If you are going to do something that requires dictation of a specific type, switch to one of the other Recognition modes: Numbers, Spell, or Command mode.